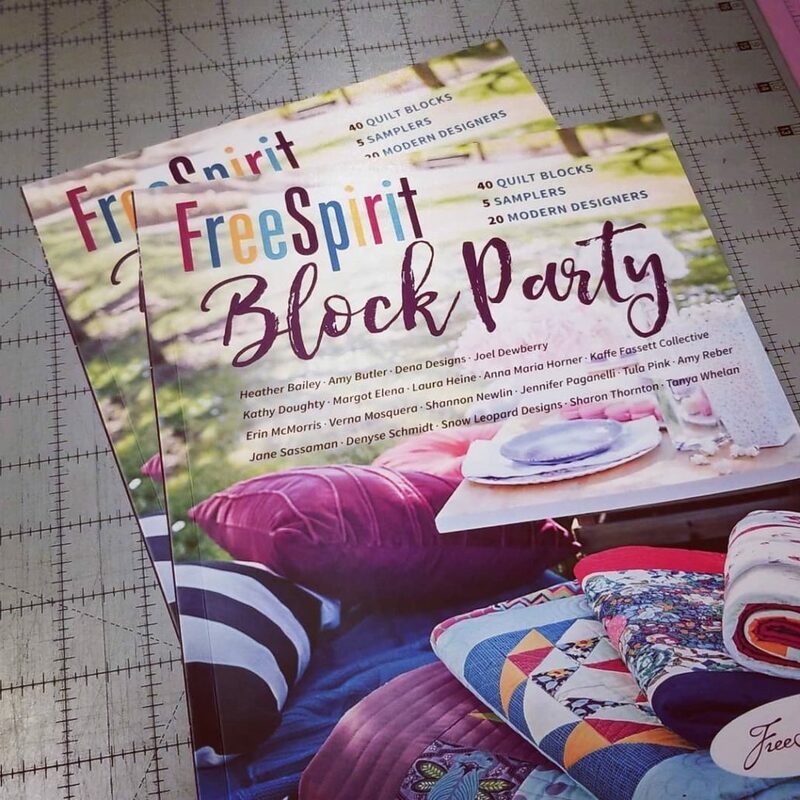 FreeSpirit Block Party book will be debuted at Quilt Market! Our FreeSpirit Block Party InstaBee is up and running! We have 6 hives buzzing, across the world! Quilters from the United States, Canada, Denmark, France, and Australia are participating. Follow the #FSBlockPartyBee hashtag to see some amazing blocks being created and shared. Did you miss the news about our FreeSpirit Block Party InstaBee? Learn more HERE. Most quilters will have heard of International Quilt Festival that occurs in Houston each year. It is an amazing quilt show and one of the best in the country. But do you know the week prior to Quilt Festival, is Quilt Market? Quilt Market is when the quilt industry meets and shares everything about our favorite world. Fabric companies, ruler makers (as in quilting rulers – not royalty, although we think some of them are! ), designers, quilters, shop owners, and more come to Houston to learn what is happening in the industry. you can attend and learn something new. 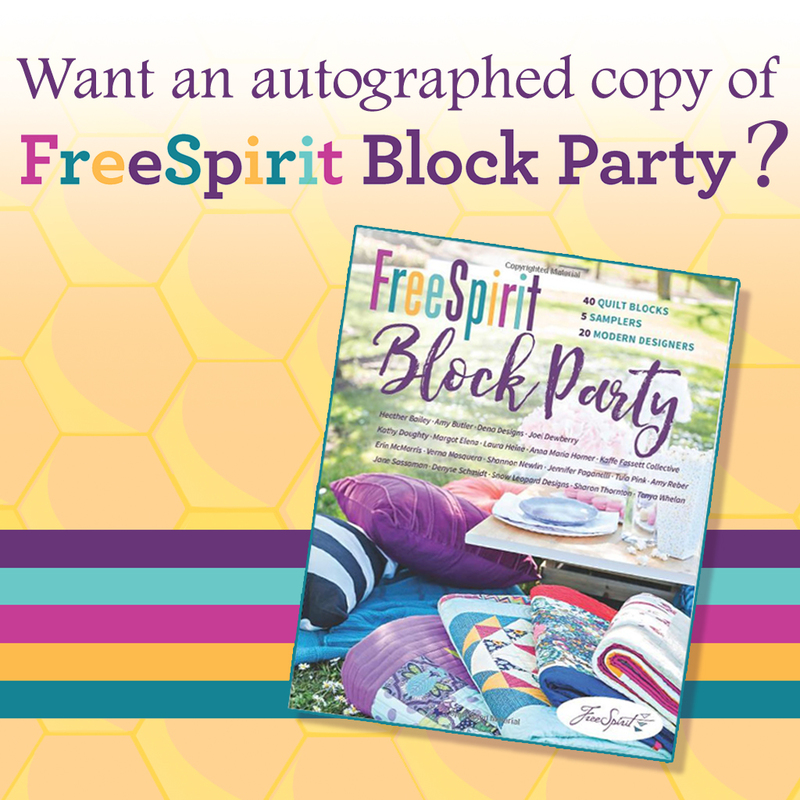 Including, our FreeSpirit Block Party book debut! For those that follow Scott Fortunoff, he listed the school house sessions for all the Jaftex companies which now wonderfully includes FreeSpirit. And our book is on the docket! Very exciting. There is also a time block that is unannounced. FreeSpirit is up to something! I wonder what it can be . . I had this in the car line, when I was flipping through my copy. I had to do some planning and configuring to make sure I could pull this off before I announced it. I am going to Houston Quilt Market and am going to have as many FreeSpirit designers that created a block for the book sign it! I have a list of 6 designers that will be present at market. Tula Pink, Anna Maria Horner, and more. FreeSpirit was even so kind to send me a second copy to do this. So you may be thinking: “So cool! I wish I could have a book with all my favorite designer’s autographs.” Well guess what, you just might. Notice above the word “second book.” Part of my big idea was Step 1: Get designer autographs in the book. Step 2: Auction the book off on Instagram and give the funds to Project Night Night. Pretty sweet right? You have a chance to win a copy of this book autographed and the proceeds are donated to a great charity! Win Win! Now our auction for the autographs will be open to anyone on Instagram. I will have some of my new FreeSpirit Instagram friends share this as well so it reaches as many people as we can and in turn earn as much money for Project Night Night as it can. I will post the book for auction when I return from Quilt Market and Quilt Festival. Auction will go live on Friday, November 9th and it will close on Sunday, November 11th at 7pm EST. I’ll be taking photos at Market with the designers as they sign the book. And yes, I will be having them sign my copy – why wouldn’t I?? So, what do you think of my big idea? Who do you want me to see first? http://handmade3d.me/wp-content/uploads/2018/10/autograph-copy-promo-blog.jpg 1024 1024 handmade3D http://handmade3d.me/wp-content/uploads/2018/10/rectangleLogo-300x121.png handmade3D2018-10-18 23:57:522018-10-20 13:57:19FreeSpirit Block Party book will be debuted at Quilt Market! Sounds like a great idea! I’ll be at Quilt Festival and can’t wait for it to start!! October blocks are almost done. Beehive#2! Great! I will be taking an EQ class at Festival on Wednesday and then shopping Thursday before the night flight back. This is super cool-can I hide in n your suitcase! Well, I am taking two suitcases. But hoping to fit tons of fabric in them!